In Germany the school holidays in various regions are starting and many, many cars head south through Bavaria to Mediterranean countries causing lots of long delays (stau s) on Bavarian roads so we decided on an early start (8am) from Munich and this was a very good decision as we had a clear run to Ehrwald/obermoos from where we took the Tiroler Zugspitzebahn. As the Zugspitze mountain belongs to both Germany & Austria, there cable cars from both countries. This was the first time I had tried the access from Austria. I can highly recommend it. As well as being cheaper than the German options, with the modern Austrian cable car you go from the valley to the summit in just less than 10 minutes in one stage, whereas from the German side it takes longer partially as you have to change cars to get to the summit. 20m only section of SOTABeams bandhopper antenna as inverted v dipole. 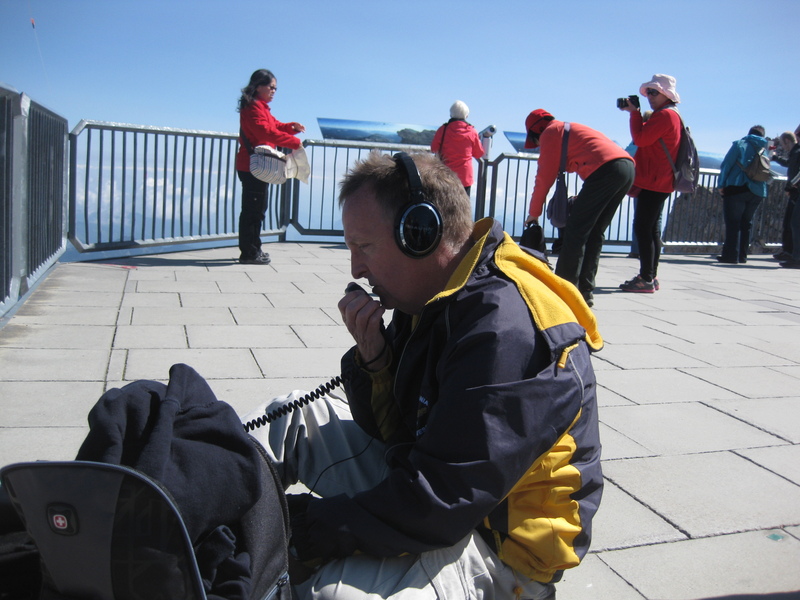 I operated from the viewing platform nearest the actual summit (on the German side of the border). Even though it was early there were already a lot of people around so I needed to take my spot quickly. Some of the railings are slanted so these are no good for fastening the ‘sqid pole’ (aka fishing pole) to. Luckily I found some vertical railing and with the help of my wife and her friend (both of whom had never been on the Zugspitze before and totally enjoyed the day) I managed to erect the antenna quickly between gusts of cold wind (temperature on the Zugspitze during my visit was 2 degrees Celsius). I took a quick look around and found that my planned frequency of 14.285 Mhz appeared free so switched to the smartphone to self spot. After my problems with Internet access the previous week, Andy kindly set me up with SMS spotting capability. I had tested this earlier in the week and it had worked fine, so it ‘should’ work fine here as well, but it didn’t as I had lost phone service when I went into Austria and now the phone needed to be manually set back to a suitable mobile network provider. Of course all of this happened in sunlight where I can hardly see the screen of the phone and when I was in rush to start before my fingers froze (I had gloves of course but operating and writing with gloves on is difficult). I decided to simply put out a call even though I was a good 30 mins ahead of my planned schedule and thankfully Martin DF3MC came back to my call with a BOOMING strong signal. 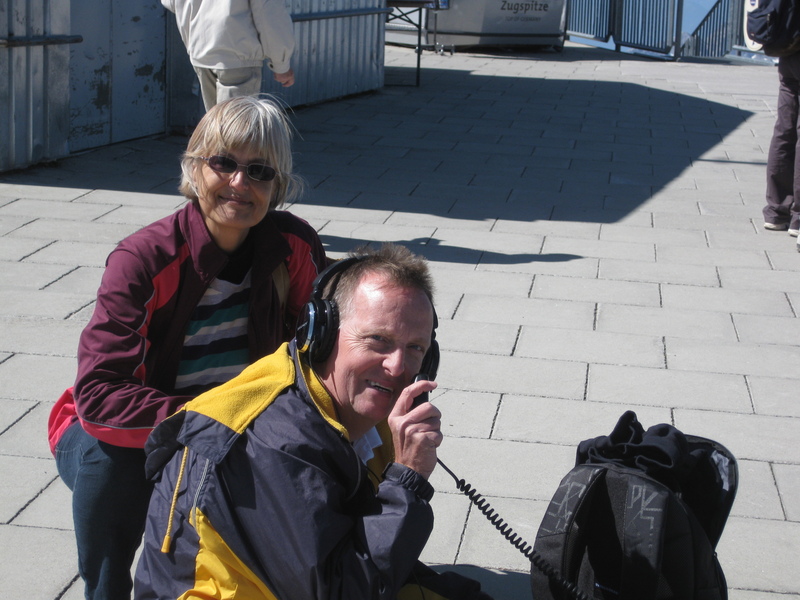 Martin had helped me with advice about several German SOTA summits, so I had hoped to work him. 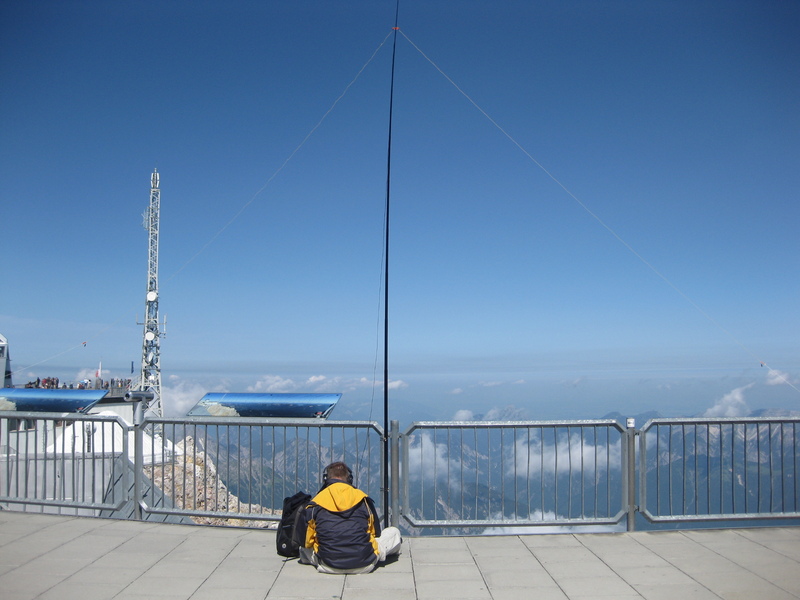 I had hoped to contact Rudi HB9MKV/OE7WRJ who also helped me in my preparations for the Zugspitze, however that contact was not to be. Thanks to both Martin & Rudi for their very useful advice. Once Martin ‘spotted me’ on SOTAWatch, as the old saying goes – the rest is history. I had a pile-up of many more stations than I could hope to work, so I apologise here to those who called but I could not get back to, before I had to pack-up because I had lost feeling in my fingers and the area where I was, was becoming busier with more public arriving on each cable car. DF3MC EA2DT GI4ONL G0RQL EB2JU EA2CKX M3XIE EA1DFP LY2AE DJ1SD M6BLV G4APF G0TRB EB2CZR M0BSV PA0B GW4ZHI. Working into the distance from above the clouds! 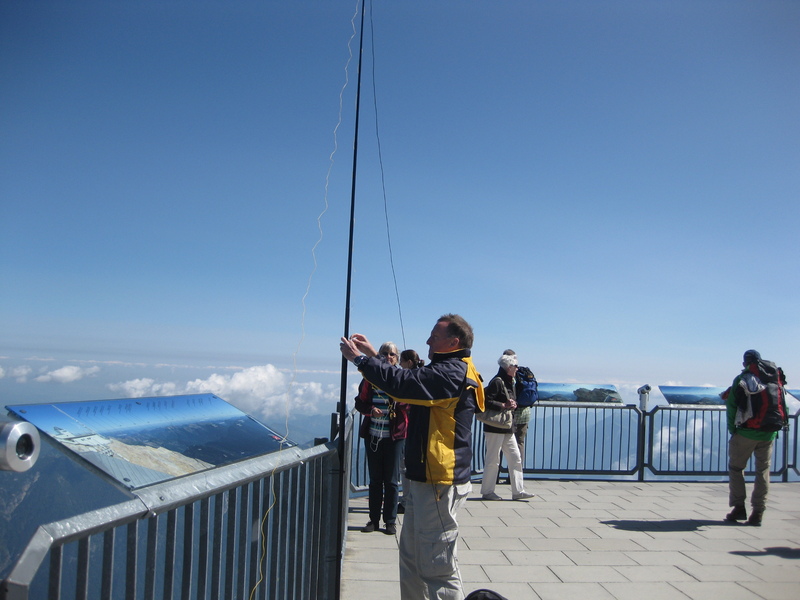 Next activation OE/TI-517 Hohe Salve on Wednesday 17/7/13 around noon local time – 14.285MHz.